EVERY YEAR, A NEW GAME IS RELEASED TO CONTINUALLY CHALLENGE NEW AND OLD TEAMS ALIKE IN ORDER TO KEEP THE PLAYING FIELD AS LEVEL AS POSSIBLE. 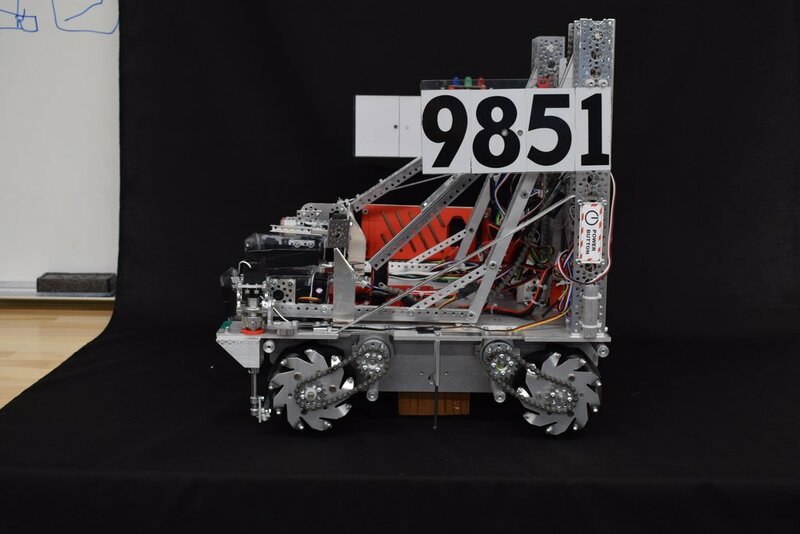 IN 2018, Rover Ruckus WAS ANNOUNCED AS THE OFFICIAL GAME FOR THE FTC SEASON. Every match begins with a 30 second period called “autonomous”. Robots can only drive using pre-programmed instructions to complete various tasks, and the drive team is not allowed to interact with the robot or its controls in any way. In Rover ruckus, each robot starts positioned on one side of the lander. 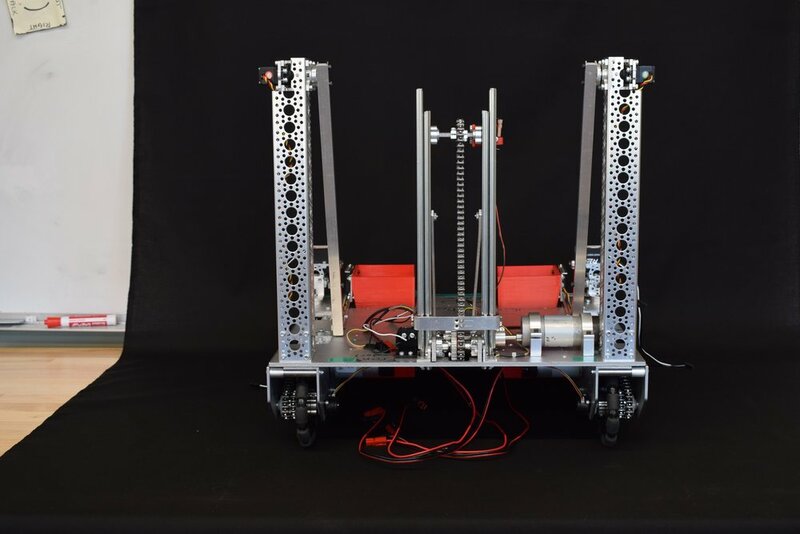 Robots can begin on the ground or latched and raised for points. In front of every robot is the “sample field” - the objective is to correctly identify and move the golden mineral without disturbing the two silver minerals. Every team must construct a team marker, a small identifying object between 3x3x4” and 4x4x8”. Teams can deposit their marker in their alliance’s depot for points. If both markers on an alliance are deposited, the depot is “claimed” - claiming a depot prevents the opposing alliance from taking minerals from the depot during teleop. Robots can also “park” along the crater rim for points. Robots can collect and deposit minerals during autonomous. After autonomous ends, drivers pick up their controllers and begin to manually pilot the robot for a 2 minute period called “teleop”. In Rover Ruckus, the objective is to score both the gold and silver minerals in the lander or the scoring depots. 2 sides of the lander are sectioned off for each alliance - the side facing closest to the crater is dedicated to silver minerals, and the side furthest from the crater is dedicated to gold minerals. Minerals in the wrong section are not counted for points, and, robots cannot control more than 2 minerals at a time when outside the crater rim. The last 30 seconds of this 2 minute period is called the “end game” - it unlocks a special goal that will earn teams high amounts of points if completed. In Rover Ruckus, the end game activity is latching to the lander and raising the robot off of the ground. Collection is fast, reliable, and as error proof as possible. The narrow mouth and channel, complete with an internal door, is designed to hold only 2 minerals at a time so our drivers can collect with ease. The middle red portion is our gravity sorting mechanism which automatically sorts gold and silver minerals. The entire mechanism extends on rails to reach back in to the crater. After minerals are sorted, they are deposited in to two delivery buckets. With silver on the left and gold on the right, our depositing works on both sides of the lander without any extra effort on the driver’s part. Lexan shielding on the back of the collector, around the buckets, and on the interior of the robot deter sorted miners from falling out while moving and prevents falling minerals from becoming lodged within the robot. 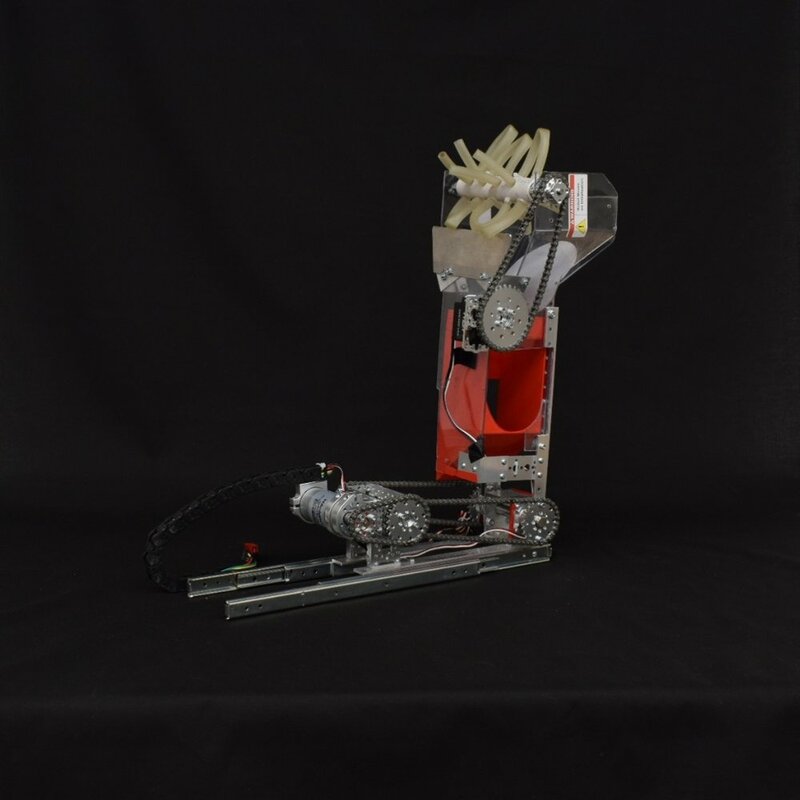 Servos with thin pieces of metal mounted at the mouth of the buckets prevent minerals from falling out while raising the arms. The lift features a simple, robust hook design that allows the drivers to strafe and latch within a couple seconds. Thanks to the Yellow Jacket motor, it takes about 7 seconds to maneuver, latch, and hang for endgame. Our mechanum drive system has been custom designed, milled, and built for precise, fast driving. Strafing allows us to easily maneuver around the crater, and the Andymark Orbital 20’s minimize our travel time between the crater and lander. Our marker is a simple yet effective design. Placed in and deposited by the collection mechanism in autonomous, this 50% solid part is durable and marks the depot clearly.